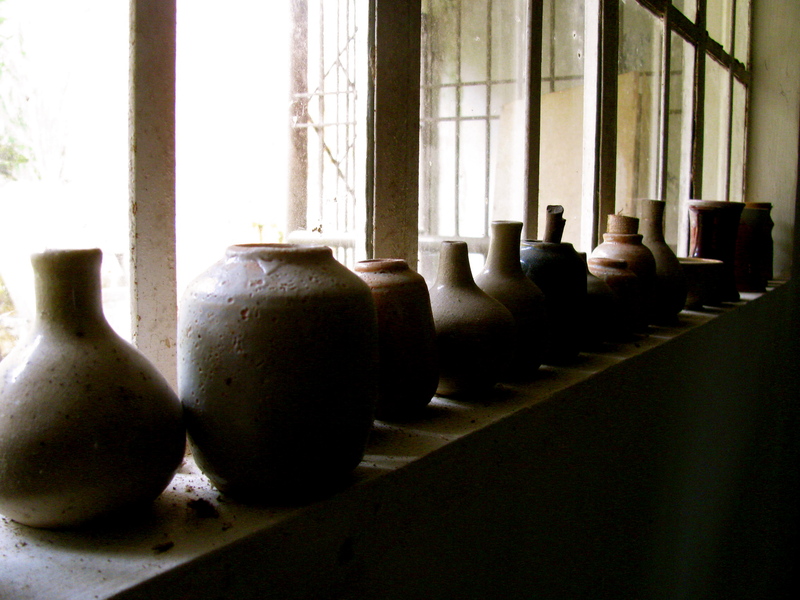 Pottery Haven in Baguio – CREATE. PLAY. TRANSFORM. Traveling in my country, The Philippines, has always been a favorite way to explore beautiful places, eat local food, and meet new people. During my trips, I make sure that I meet fellow potters. Most of them are found in rural places, where they use their backyard as their work area. And some are off the main roads with beautifully designed homes, which carry their studio and their handmade pots. There are no maps going to where they are. Thanks to landmarks and kilometer posts. 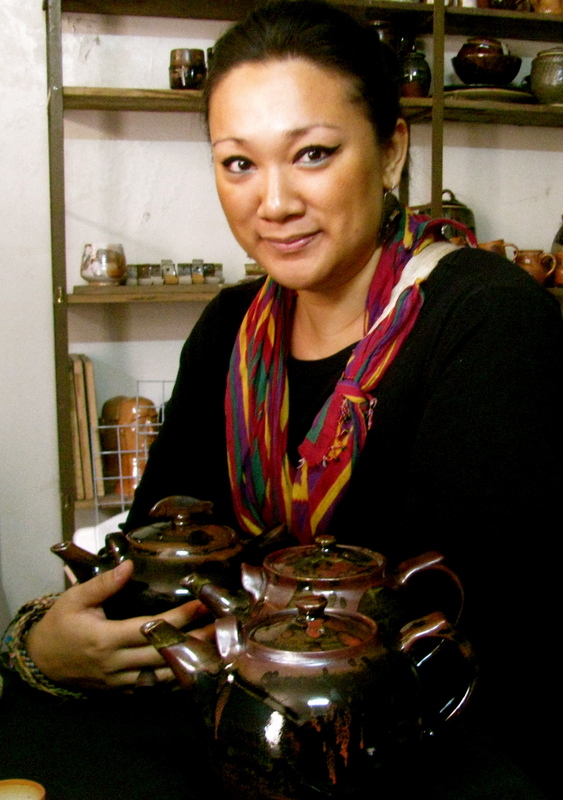 They help me a lot in finding my way to see these pottery havens. I’ve been to the nearest, and easy to locate ones. 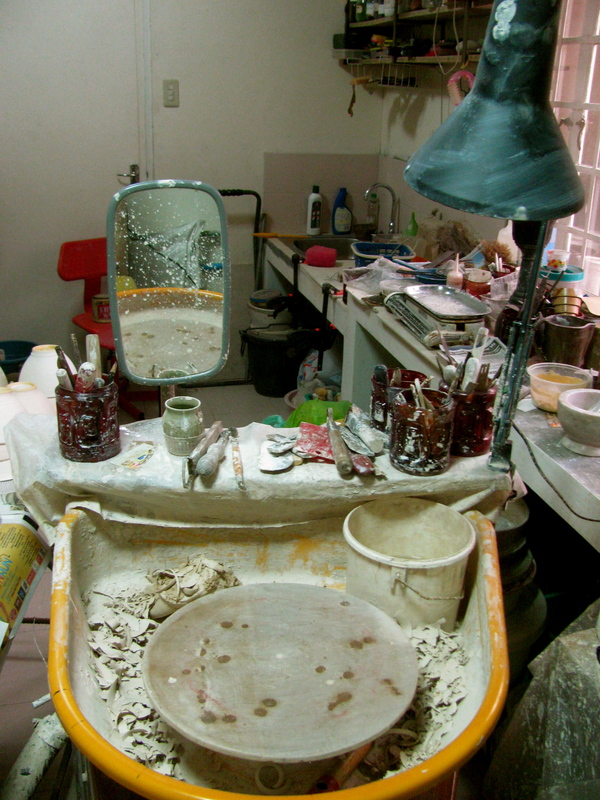 I’ve also seen other pottery studios that are isolated. I make sure that I am more patient in traveling than forming pots on the potter’s wheel. Once I lose my patience in finding these places, I will never see them. 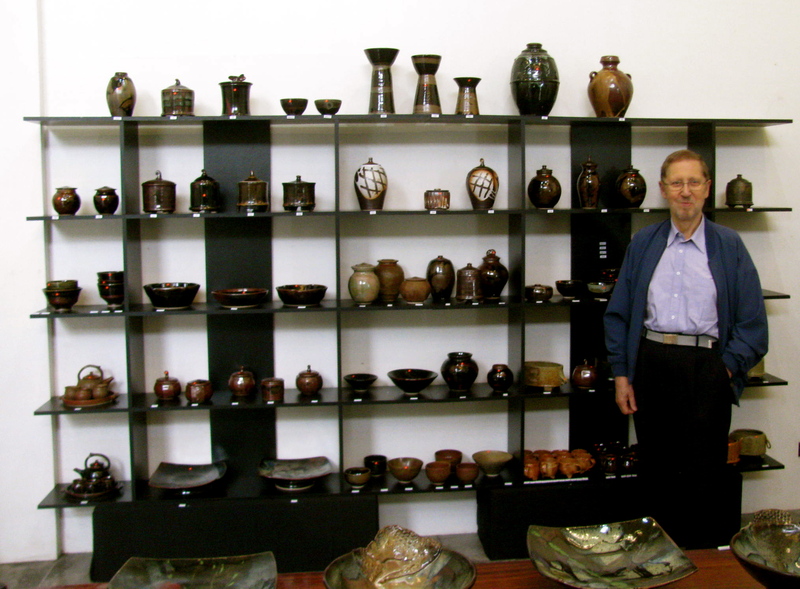 A week ago, I received an invitation from a Belgium potter, Jeff van den Broeck. 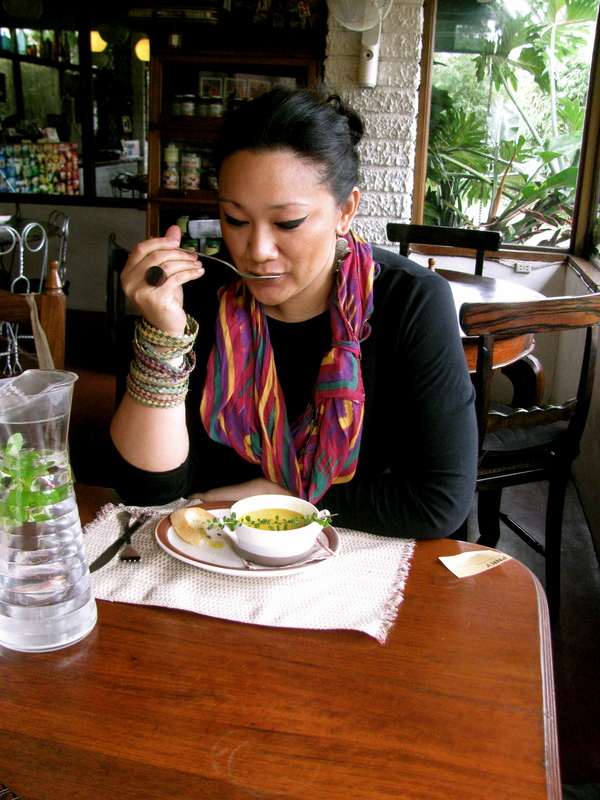 He is based in Baguio City in the northern part of Luzon with his wife, Angie. I couldn’t believe that he’s been in the country for over a decade now. A trip to a potter’s home is always an exciting thing for me. Potters share ideas, tools, and impart stories of common failure and success. A day after receiving the invitation to see his pottery exhibition, I didn’t think twice and went to the nearest bus terminal. Buying a ticket was easy. I was expecting a long line of passengers by the cashier. It only took me five minutes! I can make my reservation online too! Keeping the ticket in my wallet was the most joyful part of my day. I knew I was going on an adventure by myself, which I’ve missed so badly. So, here I am, right inside the Victory Liner Deluxe. 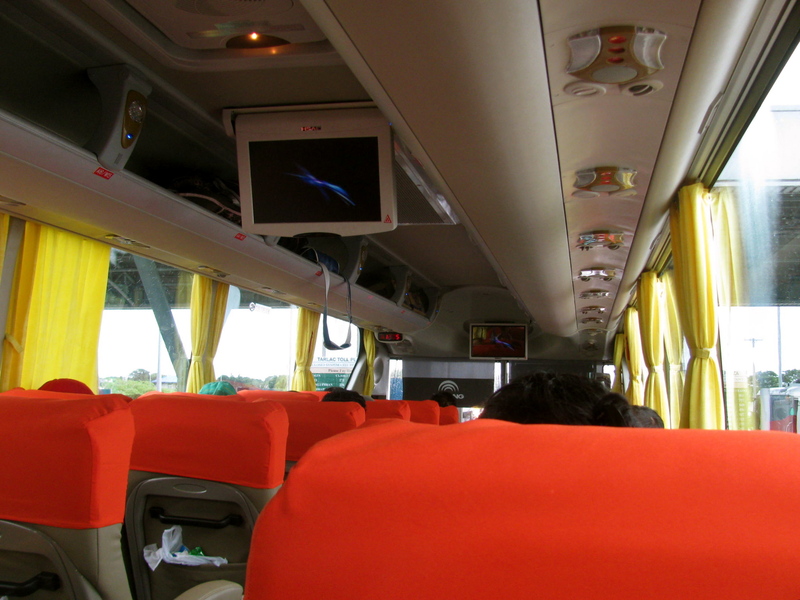 A very clean and smooth five-hour ride from Manila to my destination. The weather was perfect. Not too sunny, not rainy. I had my vegetable sticks in my food container with my home-made dressing, bottled water, and a good book. It was a very beautiful day to be out of Manila. Jeff welcomed me to his pottery studio with great hospitality. He doesn’t give his residential address to the public. I knew right away that my visit was special. There were six rooms that he showed me last Saturday: The kiln & glazing room, the garage where he stores his pots, and takes photos of his works, the main pottery studio that holds his pug mill and potter’s wheels, the clay printing studio, his library which carries the most amazing book selection of European, American, and Asian Ceramics, and the foyer to his home. My eyes feasted on everything that was shipped from Europe. His kiln, the pug mill, and the wheels that spin and bring life to his balls of clay. Showing tools to fellow potters is like sharing self-experimented ideas. Each potter has the basic set of tools to form and trim pots. But there are tools that one discovers along the way. 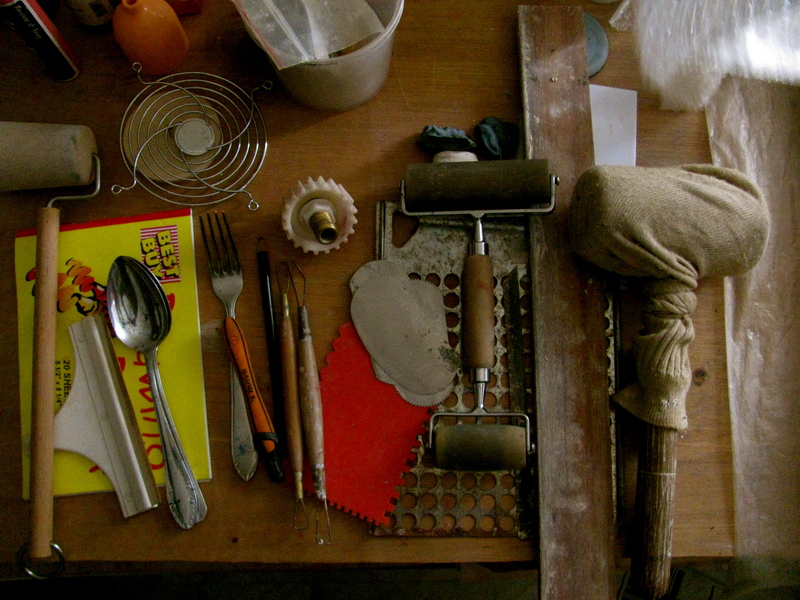 Tools that one create after finding them in the home. Angie, Jeff’s wife, jokes around and says, “If I don’t see some of my kitchen utensils, I know they’re in Jeff’s studio!” These are tools that stay very useful in the pottery studio. The ones that are not very useful are kept in a special storage container that can be used later on. Just when I was starting to be overwhelmed with all of Jeff’s treasures, I saw a staircase that leads to the loft. I asked what was up there, and he simply answered, “Upstairs is where I do my clay printing.” Even more excited, I said, “Wow! There’s more to see here!” On the way up, I saw these lovely little pots, sitting on the window sill. Being in art studios always excites me. There is always something new to see. New tool, new material, new inspiration, new passion. An artist can stay in his/her studio for hours. Sometimes days. It’s a sanctuary for creation. A secret place for freedom. A place for self expression. A walled space filled with an artist’s personality, creativity, and life. But when you see their creations, they are definitely made and thought outside the box. Handmade. Unique. Set apart. 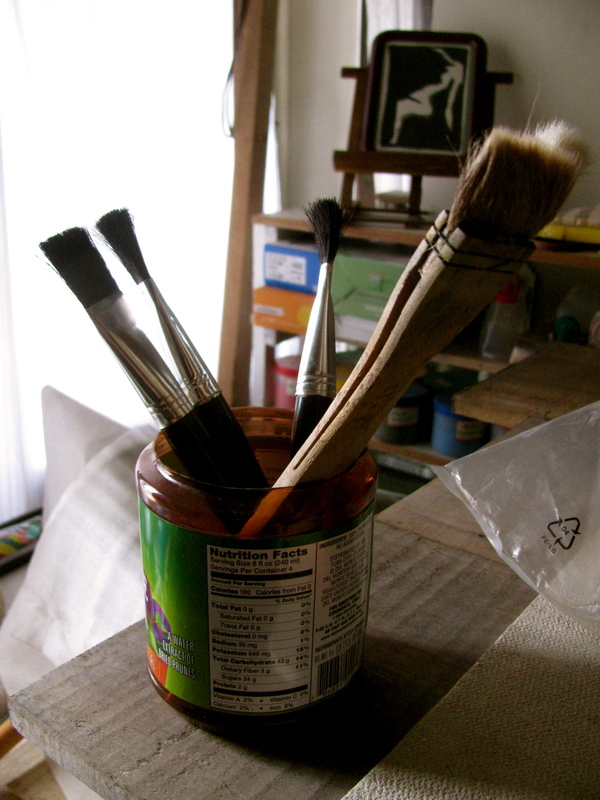 Here are some of his brushes that he uses for clay printing. 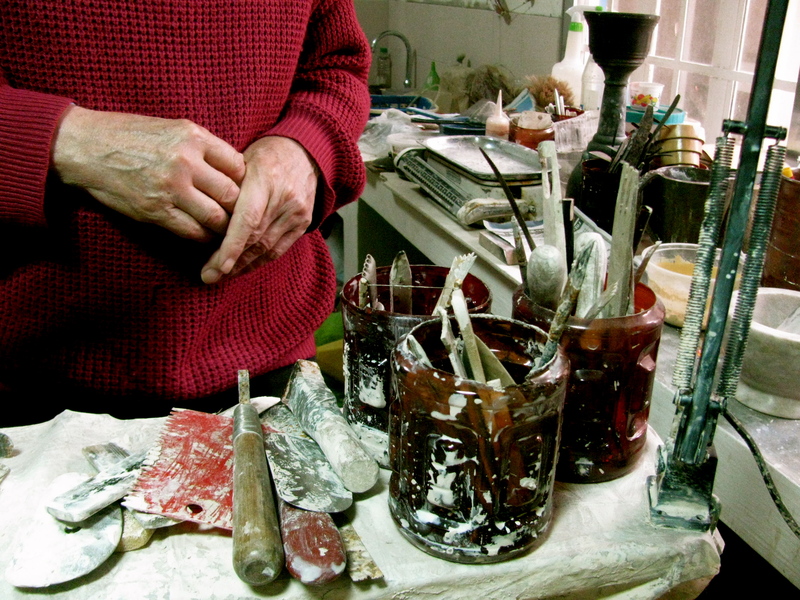 He has another set of brushes for glazing his pots too. These are just some of the many tools that Jeff uses in the studio. 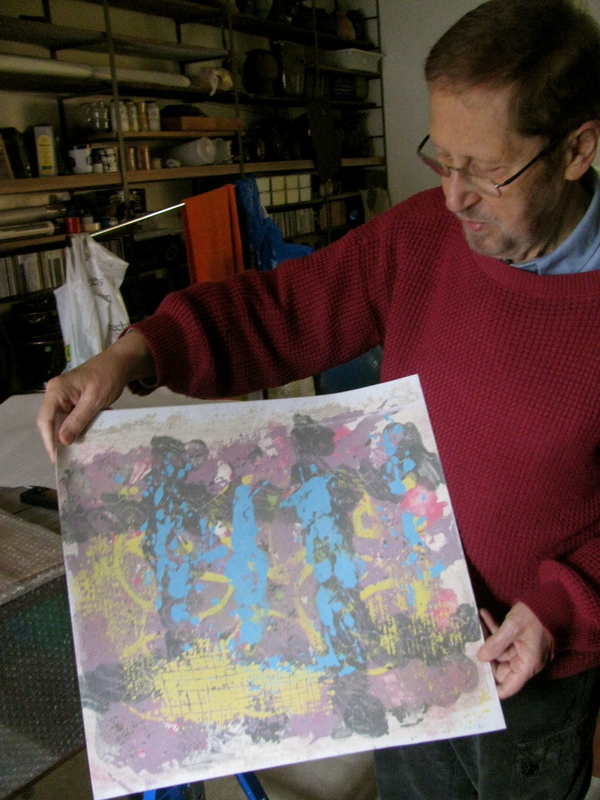 He learned creating clay monotypes during a workshop he took in Australia. Clay Monotype is a painting and print making technique using clay slip with different pigments. The pigments are applied on leather hard clay using various direct painting and transfer methods. Once an image is formed, it is transferred to a non-woven fabric with a wooden roller (shown here). I keep noticing a tinted sliding door right next to the clay printing studio. Me and my nosiness! I asked Jeff what was in there and he said, “I have my library in there.” I thought I’ve seen it all. I was definitely having the best time of my trip at this great potter’s home and it’s only 10:00 am! As soon as he opened the door to his knowledge room, my jaw totally dropped. 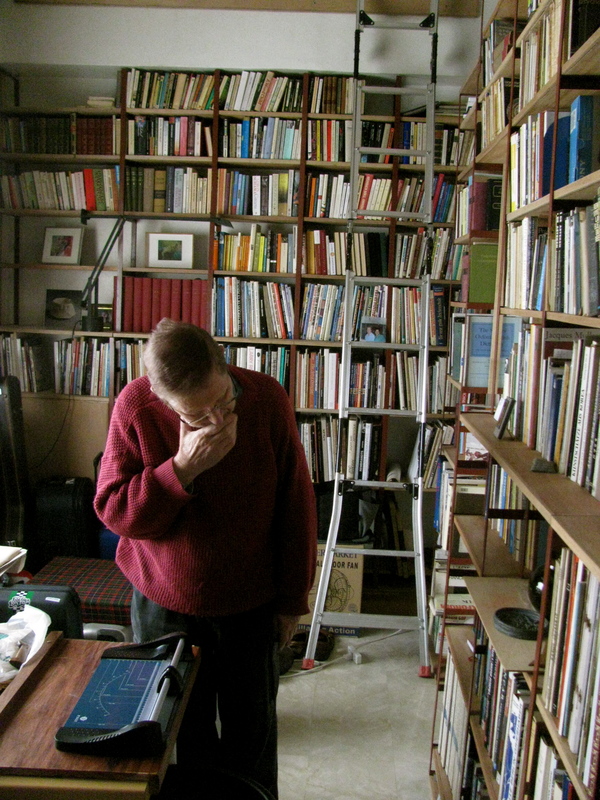 I browsed through hundreds of his books and found some that I have too. It was great to hear his comments about some of my favorites. A lot of contemporary potters write books on pottery: techniques, photos, inspirations, etc. But we both agree that the old ones are still the best ones to keep. After doing a studio tour of Jeff van den Broeck’s home, I headed to Pynky Cafe at Leonard Wood Rd. I thought of everything that I saw and learned today from a great artist. There was something that stood out during my visit. Greater than the beautiful pots, tools, and equipment, it was Jeff’s and Angie’s hospitality that made it to the top. They didn’t know me at all, but they welcomed me with so much warmth into their private space. I respect people’s privacy because I want mine to be respected too. 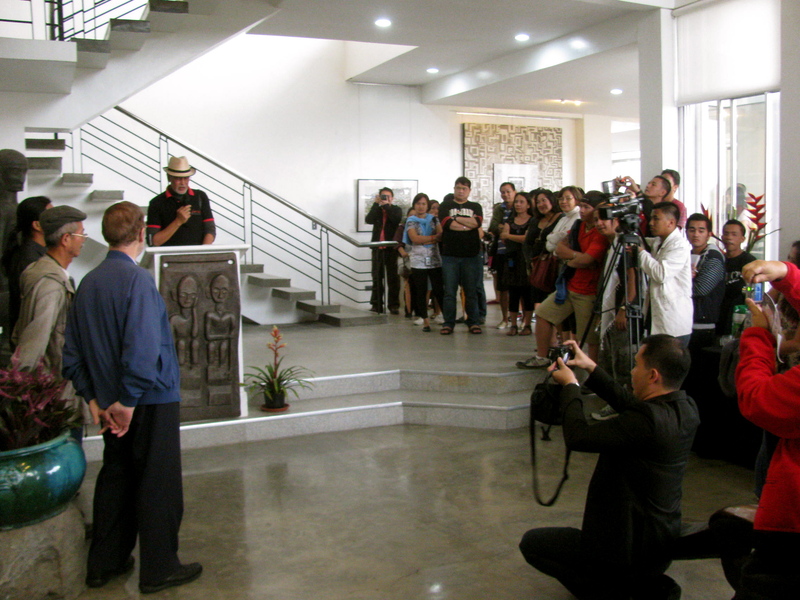 After having my lunch and walking around the city of pines, I headed to The Bencab Museum to see it for the very first time, and see the opening of Jeff’s pottery exhibition. I was at a loss for words to describe the location of the museum. One has to go and witness the beauty, serenity, and mystical vibe of the whole place. Bencab is introducing the three artists here who opened their show to the public last Saturday. I went to Baguio City because of this man. I’ve finally met him! It was a great weekend because of his hospitality, grace, knowledge and passion for Ceramics. I always ask fellow potters to give me a little piece of advice or encouragement in doing what I do. Here’s what Jeff told me, “You have to enjoy clay and the process of letting go of your imagination and creativity. Run after them. Don’t let them rest.” I am taking hold of these words that come from a fellow Potter, who has taken on an uncertain path that brought him to his successful life as a Potter today. All in all, this has been one of my best pottery trips in the country. This trip reminds me of a tour I did at Robert Compton’s pottery studio and home in Vermont, USA. A lot of good memories to keep and be inspired from. Thankful for these people, who are not limited in sharing their stories, success, failure, and dreams. I’m writing this from my pottery studio here in Manila. All inspired and ready to create new works that I like. Hoping that they will find their way to people’s homes this Christmas and the years to come. ‘Til we meet again, Jeff.